With most people working long hours every day and sometimes even on weekends, it usually means that you need to eat at least 5 meals a week at work. For some people this is a total dilemma, because they want to eat better and healthier without having to do much work, or pay an arm and a leg for being healthy. With a little preparation and thinking ahead, it could be much easier than you think. 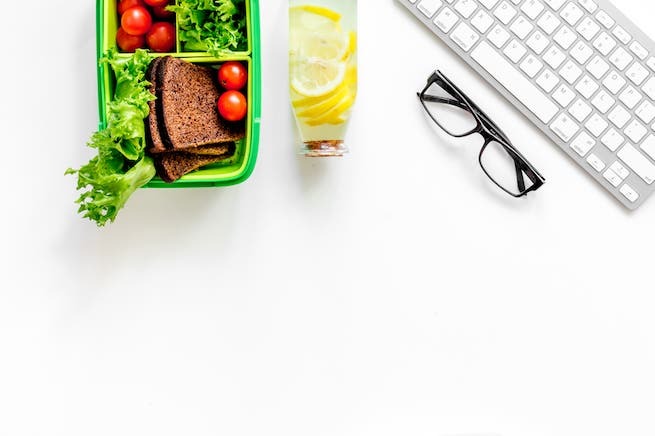 Try these simple strategies for eating better and healthier at work and avoiding the food temptations that lurk around every corner. The general rule is that whatever food packed for lunch at the workplace must not be smelly, messy or noisy when eaten. Respecting other people is important especially if a designated eating area is not available and lunch will be eaten in an open work space. Fresh fruits and vegetables are always a good idea. Consider slicing and dicing the fruit or vegetable at home to make it easier to eat at work. Dried fruits are also a great option, they are nutritious and healthy and don’t need to be refrigerated or anything. Dried dates and date bars are easy to find in most supermarkets and are very nutritious. Nuts are a wonderful alternative too. They are small, easy to carry and pack in a lot of nutrition for their small size. Nuts can now be bought in snack size bags which are perfect for lunch. Yogurt is also great but you will need to have a refrigerator at work. Zaatar and cheese filled pies (fateer) are also great you can buy them and freeze them, and just grab a frozen pie in the morning, by the time you want to have lunch it will have been thawed. Prepare your lunch the night before because it is always easier to just grab it and go instead of having to add “making lunch” to your early morning routine. Use good quality containers that won’t open in your bag and make a mess. Containers with screw-on lids or lids that lock are safer than just regular lids. If you can, take your lunch in a separate bag instead of carrying it in your purse or laptop bag. Just in case your lunch explodes you will be happy to know you don’t have salad all over your computer. Consider investing in an insulated lunch bag if you know you will be taking lots of fresh fruit and vegetables to make sure they make it to work without rotting. It is still true in many workplaces that if you come to work with a brown paper bag lunch from home other employees will make fun of you. This is probably what makes a lot of people rethink the idea of bringing lunch from home. However, it is sometimes easier for women to get away with bringing lunch from home because they don’t mind telling everyone that their salad lunch is what the diet doctor ordered. The easy way to deal with this is to just ignore it. The harder option is to make healthy eating accepted company culture by encouraging other workers to do the same. Ask management to provide a small designated eating area and a fridge to make it easier for employees to bring their food. Beware the dangers of eating out every day. Eating healthy is a commitment; it isn’t something you just try for a meal and give up when it becomes too difficult. Good food helps your health, improves your energy levels and ensures you can get through your day feeling light and productive. This article originally appeared in Bayt.com . This article and all other intellectual property on Bayt.com is the property of Bayt.com. Reproduction of this article in any form is only permissible with written permission from Bayt.com.